MAX Illumination light panel is a smart illumination solution for store and retail shelf. Store shelf light significantly attracts attention and enhances store merchandise. The LED light panel retrofits to existing fixtures and ensures consistent light output on runs up to 50,000 hours. Our light panel could quickly connect with adapter to illuminate. LED light panel could be flexible and versatile installed on the shelf to be a unit. Our super thin LED Light panel could be selected from 6mm, 8mm and 10mm thickness which can fit more restrained space. MAX Illumination led lighting sheet is used in the cosmetic under shelf, jewelry shelf and other luxury goods display shelf. Our LED Light pane assures the whole space uniform illumination and high CRI. Therefore, it is widely used in the cosmetic counter, body shop counter, watch and jewelry display and glasses display. 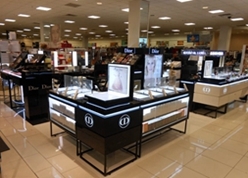 Our light panel significantly enhances merchandise vision and store fixture. If you want build an attractive store, why not utilize light panel under the shelf to obtain more attentions? For you shelf light panel, you could contact with us to get more information.